Here in Canada-Land we are not only heading into the Canada Day long weekend (Friday is the holiday), but we are also hosting the William and Kate, the royal couple who are arriving in Ottawa this afternoon. After they kick things off with a traditional Canadian kegger and barbeque, we hope they will swing by OMG! Games for some Commander games (but we won't be holding our breath on that). In other news, Magic the Gathering spoilers keep on coming from the mothership previews and there are some surprising magic 2012 core set cards which should make players happy - let's have a look now . . .
As suspected for some time, we have a new Chandra which has kicked out the Lorywn standard for core. 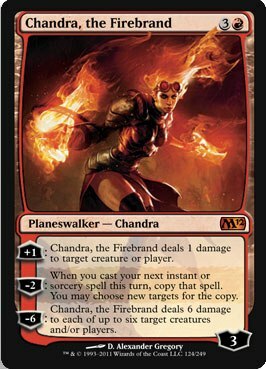 We rather like the new Chandra as one can now splash red in most decks to get this Planeswalker although her abilities are most suited to red (burn) instants. We are looking forward to possible shenanigans while proliferate is still in standard. Oh - and if you get the ultimate off, chances are your opponent will scoop. 1 : End the turn. Activate this ability only during your turn. Very interesting card is interesting. 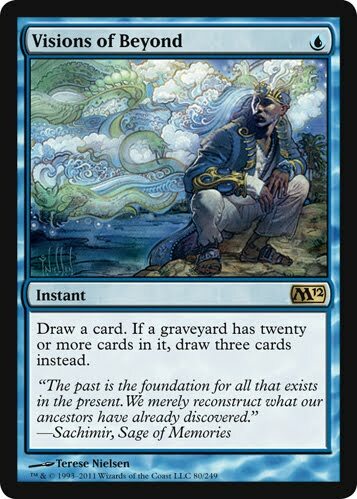 We are not sure how big of a splash this may make in standard but from Noel deCordova's article on the mothership today, there is a truck ton of potential beyond standard format. There may be some very cool plays with Sundial of the Infinite enabling combat tricks and shutting down any spells cast by your opponent during your endstep. This reprint from the original Mirrodin should make many players rather happy - especially the ones who are using tempered steel and proliferate tech to churn out cute little Pentavites and pumping them up. We are brewing up a storm of casual decks involving Throne of Geth, Grand Architect, Xneograft and the like. We love that Wizards had used the Shards of Alara artwork here. This card needed to be back (as well as Pithing Needle) in standard when the format was being wrecked by caw-blade. 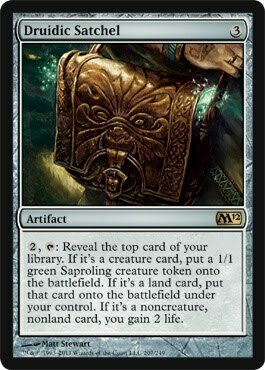 The only thing that would make this card any better is having new artwork with big-daddy Jace getting pwn'd with the ring. Anywhoos - we want you to check out the cards and pump it or dump it in the comment thingy below. Don't forget to enter our Commander give-away contest we are almost ready to draw as the numbers are creeping up to the 3 Million visitor mark. There is no sleep for Magic the Gathering news sites such like us here at MTG Realm who are attempting to keep our heads above the tide of spoilers and previews pumping out from Wizards of the Coast. We start off today with what we were calling the Magic 2012 core set 'Royal Flush' artifacts - these were the slow roll previews on Wizards' FaceBook page. We started off with artwork showing a crown, a scepter and a thone. Today we have additional text - let's look . . .
3 : Tap target creature. Taking a wild baseless stab in the dark that the last game card is 'Throne of Empires' which should not be confuzzled with the popular HBO series 'Game of Thrones'. UPDATE (6/30/2011): Throne of Empires 1 : Put a 1/1 white Soldier creature token onto the battlefield. Flavour text on the first two provide insightful inscpritions - nah - we're just kidd'n - we still have no idea what to extrapolate from what has been revealed so far. Next up - some recent rare spoilers . 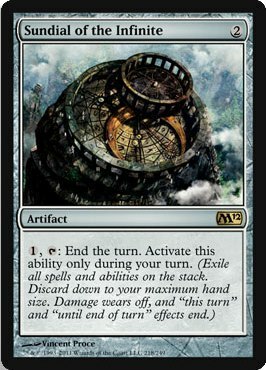 . .
Nicely done Wizards - not only is this a Demonic Tutor, but also a very solid beater. We can see this going into standard constructed decks as a finisher but we really think that this may deliver big fun in a Commander deck running Kaalia of the Vast. 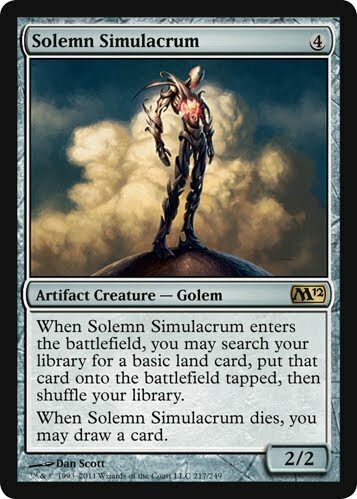 When Solemn Simulacrum enters the battlefield, you may search your library for a basic land card and put that card onto the battlefield tapped. If you do, shuffle your library. Artifact Aggro players (among others) should like this. This essentially provides two additional cards, a land and a draw. A little zing into your casual Tempered Steel build. We personally love the e.o.t.b trigger - just hope your opponent doesn't have a Torpor Orb in their mix. Next up - as expected we will be getting reprints on the rare lands - Sunpetal Grove ( / ), Rootbound Crag ( / ), Dragonskull Summit ( / ), Drowned Catacomb ( / ), and Glacial Fortress ( / ). Some players may say 'meh' but we love 'em for a core set. Stay tuned here at MTG Realm for s'more M12 spoiler goodness as we roll through week 1 of the official WoTC previews - also make sure you check out our constantly update M12 spoiler list. We are only on day two of the official Magic the Gathering previews of the new core set Magic 2012 and we have seen some very decent cards produced by Wizards of the Coast. 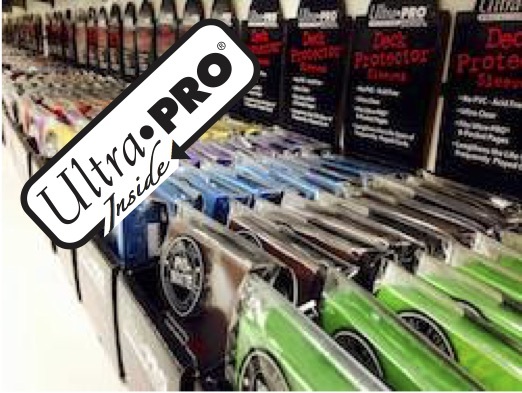 To ensure you are kept up to date on the latest card goodness, check out our Magic 2012 spoiler list HERE which we will endeavour to keep up to date. For today, as the post is unimaginatively titled 'M12 Spoilers 7, we have for you seven new cards which is sure to rock your game whatever format that tickles your fancy - enuff yattering and let's go . . . 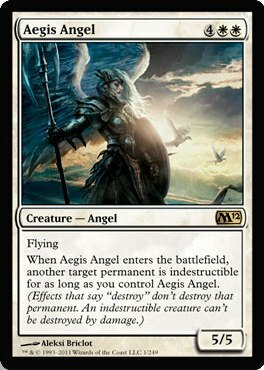 When Aegis Angel enters the battlefield, another target permanent is indestructible for as long as you control Aegis Angel. This art rocks and should be sufficient enough reason to play this. If you want the foily goodness, then grab the / Intro Pack. There could be some decent situational plays to be had but on the whole we're calling it just OK for now and not crazy good. This again is just OK but still slightly better than OK for your game should you pack your parachute and keep this in your sideboard against red burn. This is very nice. This card almost makes us to want to build a standard constructed around the illusion Lord, Lord of the Unreal (copying the lord of course) - but we know that's a trap. If the rumours hold true that the next block, Innistrad will have a graveyard theme to it, we suggest you hedge your be and pick a few of these up now. This should be rather good in dredge and promises to draw you a impressive number of cards late game. 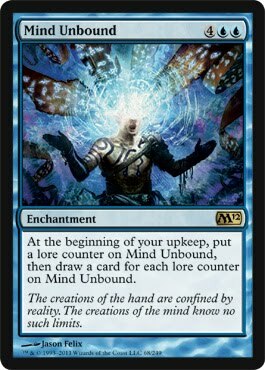 At the beginning of your upkeep, put a lore counter on Mind Unbound, then draw a card for each lore counter on Mind Unbound. The creations of the hand are confined by reality. The creations of the mind know no such limits. Anything that uses a 'lore counter' should be cool, right? Yep - this one is very cool. A bit expensive but perhaps with a bit of acceleration and a dash of proliferate, you might be rather pleased with this. 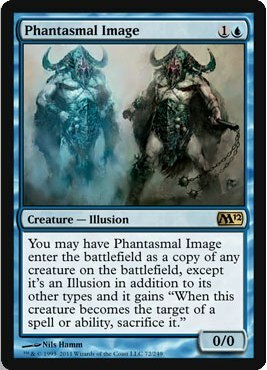 We smell some casual mtg fun with Psychosis Crawler. 2 : Reveal the top card of your library. If it's a creature card, put a 1/1 green Saproling creature token onto the battlefield. If it's a land card, put that card onto the battlefield under your control. If it's a noncreature, nonland card, you gain 2 life. You know that whatever you reveal will give you something - a chump saproling, a free land play or some life - we say not bad at all. The drawback of course is showing your opponent(s) what badness you will want to hit them with which now could set you up for some sad counterspells. 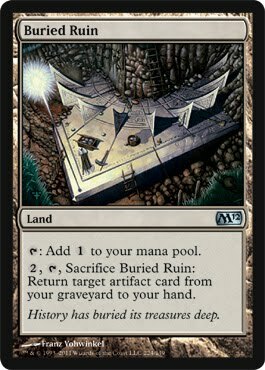 2 , Sacrifice Buried Ruin: Return target artifact card from your graveyard to your hand. Given that we just rolled through an artifact block, we can see that this will immediately get shoved into decks players are playing right now. We like that this can bring back our fav equipments which may have been nuked. Anywhoos - we want you to check out the cards and pump it or dump it in the comment thingy below. 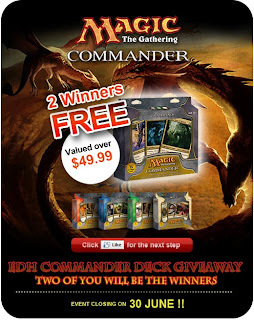 Don't forget to enter our Commander give-away contest. If you are just joining us this afternoon, be sure to double back and check out our earlier post this morning where we covered off new Magic 2012 core set spoilers Worldslayer, Scrambleverse, Skinshifter, Primordial Hydra, and Vengeful Pharaoh. From here, click on 'like' if you dare. If so, you are then presented with these arts from John Avon . . .
From this, we can assume a slow-roll spoil of the cards which seem to have affinity for each other - a scepter, a crown, and a throne - a potential cycle which we will call the 'royal flush'. Some Magic the Gathering fans are already speculating about a Kaldra type of interaction. These were legendary artifacts which were presented as a helm, shield and a sword - and when in play together produced some very nice effects. Anywhoos - speculate away in the comment thingy below !